I’m a live music novice in Second Life but I’m on my way to rectifying that. I have lovely friends like Annie Lane and Shady Forsythe who invite me out to concerts and so in the past while, I’ve attended several live shows. 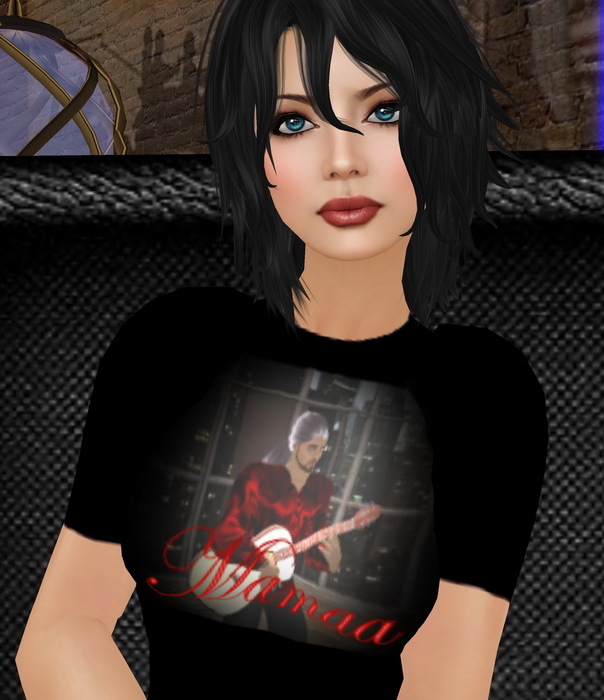 I want to tell you a bit about 3 SL artists, and show off 2 concert tees that I was lucky enough to nab! Mamaa Saiz is a laid back singer/guitar player. He plays a wonderful mix of songs, two of my favourites being Go Now and For the Good Times. As Elton John once said, “sad songs say so much!” If you throw a well-deserved tip at Mamaa’s tip guitar, you’ll get back a “Mamaa Saiz” concert-tee. A good deal there all around. At RL concerts you pay for your tickets AND you give your first born for concert merch. I highly recommend going to see Mamaa play. You’ll have an excellent time, hear wonderful music in Mamaa’s inimitable style, and experience some of the rich and varied live music SL has to offer. Music blogger Gold Cazalet wrote a great review of one of Mamaa’s recent shows, so I will direct you to Live Music in Second Life to read that. I heard TwinGhost Ronas play live for the first time last night. Oh my, oh my, what a wonderful singer/songwriter! If you get a chance, run don’t walk to hear what TwinGhost has to offer. His adorable manager, Staci Schwarz, was handing out the Black Cat fan t-shirts at the show last night. TwinGhost has a website, so you can go check that out. And finally, I want to tell you about Frets Nirvana. The things that man can do with an acoustic guitar boggle the mind! From Bohemian Rhapsody, to Minor Swing (my fave! ), to Pipeline, the energy that Frets generates during a live show has to be experienced. I don’t believe he has a concert tee-shirt, but I’m first in line if he ever decides to go that route. You can join the inworld group “Frets Friends” to keep up to date on his whereabouts. I swear, if you go to see him, you will be IMing me to thank me. 🙂 Here’s a vid of Frets doing Minor Swing. 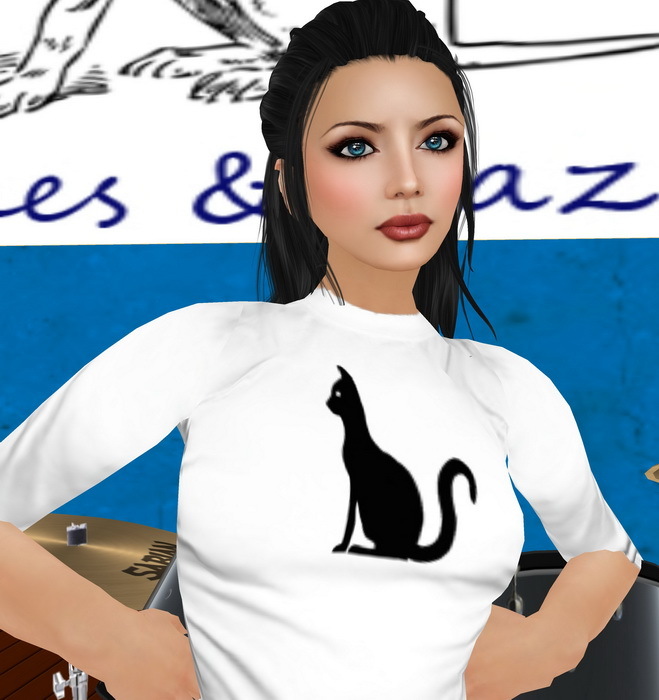 You can check out a review of a Frets show right here at Live Music in Second Life. So, that’s my first foray into live music in SL. If you know of anyone I must see, drop me a line! 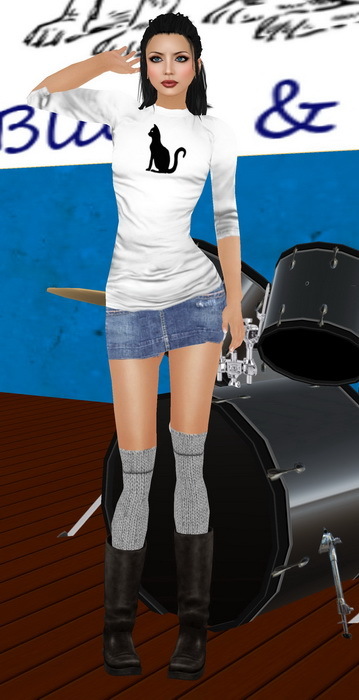 I'm a Canadian woman taking in the fashion of Second Life. If I meet a new friend or have a few laughs, all the better! This entry was posted in Fashion, Live Music in Second Life, MV-SL-Fashion, Second Life Fashion and tagged Awesome Blossom, Duh!, Fashism, Fishy Strawberry, Kboots, Le Poppycock, Maitreya, Prism, Sadistic Hacker, Xaida. Bookmark the permalink.